Although today started out bright and sunny it was cool reminding us that fall is just around the corner. At lunch Mr.D and Mr.Z picked us up and we all drove up to the Wychwood Barns to check out the new location of the Toronto Garlic Festival. Previously the festival was located in the Don Valley at the Evergreen Brickworks on the other side of the city. It was nice to see it located closer to us and wandering through the booths both outside and inside we saw more garlic than you believed possible. Mr.T and I picked up some bulbs for planting in the backyard even though to date I haven't really had a lot of luck planting garlic. Every year I have planted it in the fall waiting patiently to find it blooming in the spring but never actually having it bloom. After the garlic festival we drove over to Roncevalles to check out the Polish Festival which had the street shutdown from Dundas West to Queen Street. 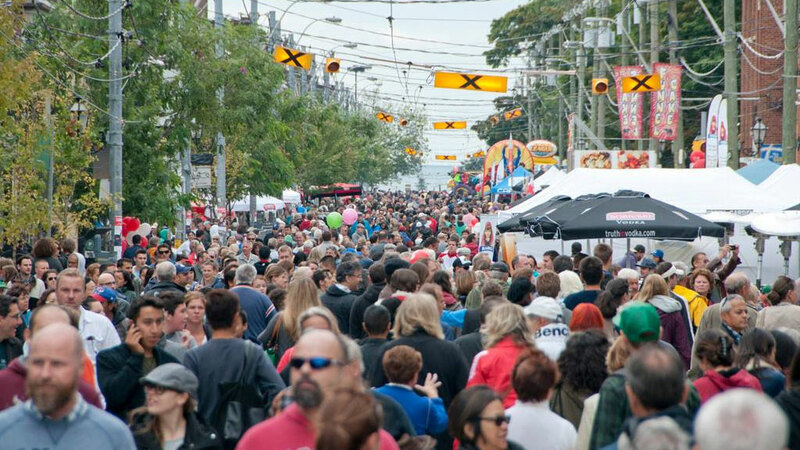 Walking up and down the street there were lots of booths and food options but everything looked the same as most other Toronto fairs and street festivals. Street festivals really should be about local offerings and not the chain type street booths that pop up at all the street fairs. I was however impressed to see a local meat place offering veggie corn dogs and was pleased with how good they were. Using Yves veggie dogs cut into two equal pieces they were dipped in a rich grainy corn batter that turned out delicious. It was light, crispy, grainy and delicious with some hot mustard, the perfect fair food. After walking up and down the street we all hopped back in the car and headed over to Kensington where I was able to introduce Mr.D to the vegan ice cream offered by Cosmic Treats on Augusta. Ice cream sundaes were the perfect way to end a day exploring fairs with friends. It was one of those perfect days, not too hot and not too cold, exploring fairs and food with friends.